Bevier Creative recently built a new website for Carolina Diversified Builders, helping educate home buyers on high performance homes. Gilbert, SC—Oct. 5, 2011 Carolina Diversified Builders, an award-winning home building firm that constructs high performance homes in South Carolina and North Carolina, today announced the launch of its new, expanded website, http://carolinadiversifiedbuilders.com/. Designed to educate home buyers on high performance homes, the new website highlights the company’s history, portfolio of designs, industry certification and multi-faceted construction services. The new website, designed and developed by Bevier Creative, provides a high-quality visitor experience with enhanced features to provide visitors with testimonials from happy home buyers, press updates, social media interaction, an expanded photo gallery of completed homes, a note from the owner of Carolina Diversified Builders and much more. Carolina Diversified Builders offers a wide range of construction technologies, including modular, log, timber frame and structural insulated panels. As certified green builders, Carolina Diversified Builders has built some of the most energy efficient and sustainable homes in South Carolina and North Carolina. “In short, we build homes that we are proud of. We are very happy to have the first locally and nationally certified green home in the Greater Columbia area,” says Seymour. Carolina Diversified Builders built the first home to be certified green by the Build Green Greater Columbia program. Additionally, the home is ENERGY STAR Certified and is a certified Gold level green home in the National Green Building Certification Program administered by the National Association of Home Builders Research Center. There are three levels of certification in the Build Green Greater Columbia program: Bronze, Silver and Gold. The home built by Carolina Diversified Builders is certified at the highest level – Gold. ABOUT CAROLINA DIVERSIFIED BUILDERS: Carolina Diversified Builders was founded in 1999, when Bill and Kathy and their two sons, William and Daren, decided they wanted to start a family business. They’ve built dozens of high performance homes in South Carolina and North Carolina since they opened their doors. 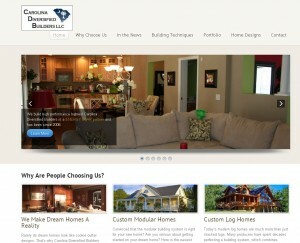 Visit their website, http://carolinadiversifiedbuilders.com/, for portfolios of award winning designs and photo galleries of completed homes.